Phytoceramides are a plant-based product that aim to hydrate and moisturize your skin. This is key to keeping your face looking young and wrinkle free. 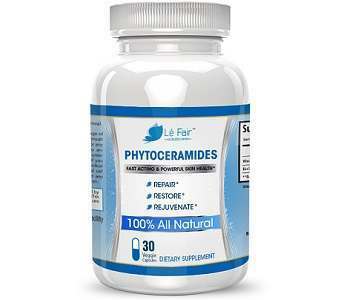 In this review of Le Fair Phytoceramides, we will examine the ingredients and effectiveness of their anti-aging formula. There are clinical studies that suggest phytoceramides can increase the levels of collagen in our skin, which will keep it firm and plump, and can help to diminish wrinkles and dark circles. As we age, our skin is more likely to lose its natural elasticity and become dry and wrinkled. Phytoceramides may be the miracle cure to combating signs of aging. Wheat germ oil and rice bran oil is inside the capsule. The capsule itself contains silicon dioxide and vegetable cellulose. Although there are many reports and research studies that claim silicon dioxide is safe, there are also inconsistent and contradictory reports about the dangers of silicon dioxide. We noticed that the actual levels of ceramides are not mentioned on the label of this bottle, and it does not contain other essential vitamins such as vitamins A, E, C, D.
The serving size on the bottle says that one capsule should be taken daily. However, if the combined amount of ceramides from the wheat germ and rice bran is 700 mg, this is much higher than the recommended daily amount and may be harmful to your health. Although, we cannot say for sure if this is indeed the level of ceramides because it is not directly stated on the label. There are no side effects associated with Phytoceramides. However, always consult with your doctor before taking any supplements. You should not take this product if you suffer from allergies to wheat, gluten, sweet potatoes or rice. 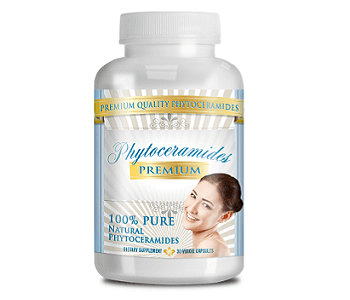 On Amazon and on the company website, Le Fair phytoceramides costs $11.90. On the Le Fair website, you cannot buy in bulk. On Amazon, you can purchase 6 bottles and receive a 15% discount. On Amazon, the company states that they offer a lifetime money back guarantee. On the website, they have a disclaimer that says they will either give customers a refund or product replacement. However, the product replacement is limited to 30 days. This product has many positive reviews on their website and on Amazon. It seems to help with improving skin hydration to minimize wrinkles, crow’s feet, and dark circles. They also offer a lifetime money back guarantee through their Amazon store, which is a really great policy for customers who want to test out the product risk-free. However, some customers have stated that they have not noted any noticeable differences in their skin. Additionally, it is important to note that most companies will state how many milligrams of Phytoceramides are contained in the supplement, however, the label on Le Fair Phytoceramides only says how many milligrams of wheat oil and rice bran. The total combined amount of wheat and rice bran is far higher than the recommended dosage of phytoceramides, and the supplement does not contain any other essential vitamins like A, C, D, E which are very beneficial to improving your skin and overall health.